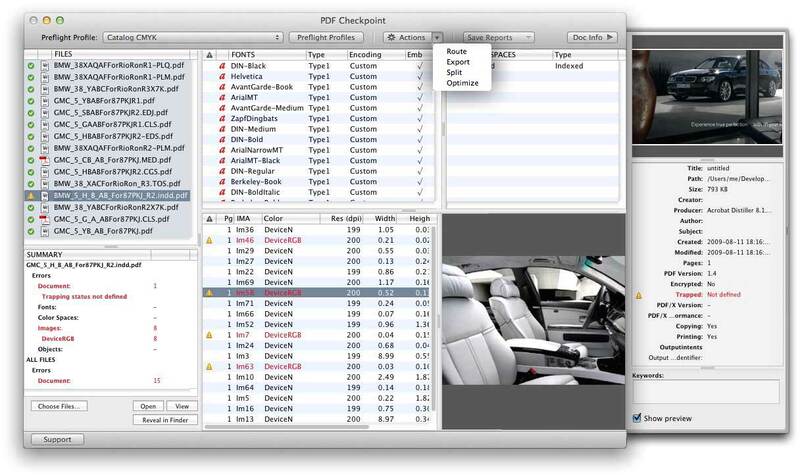 [prMac.com] Toronto (ON) Canada - Zevrix Solutions today is proud to announce the release of PDF Checkpoint 1.7.19, a feature update to the company's PDF preflight and conversion automation tool. Remarkably fast, PDF Checkpoint automatically preflights, exports as images, splits and optimizes multiple PDF documents. PDF Checkpoint is an ideal program for users who need a fast, affordable and easy to use solution to check PDF files for errors and prepare them for print, web and mobile devices. The new version introduces the option to check PDF document for specific font names in addition to the existing ability to preflight font type, encoding and embedding status. The new feature is especially useful to catch PDF files produced from Adobe InDesign documents with missing fonts by checking the PDF for common substitution fonts such as Myriad and Courier. The update also introduces case-insensitive keyword search and improves the reliability of preflight profile auto-saving. "It's a great idea to enable color profile conversion in PDF files so easily," says Miles Linklater of design studio 24pt Helvetica in Vancouver, Canada. "PDF Checkpoint saves me a lot of time when submitting ads for large magazines." PDF Checkpoint can be purchased on Mac App Store and Zevrix website for $39.95 (USD), as well as from authorized resellers. The update is free to licensed users. Trial is also available for download. PDF Checkpoint requires Mac OS X 10.7-10.12.